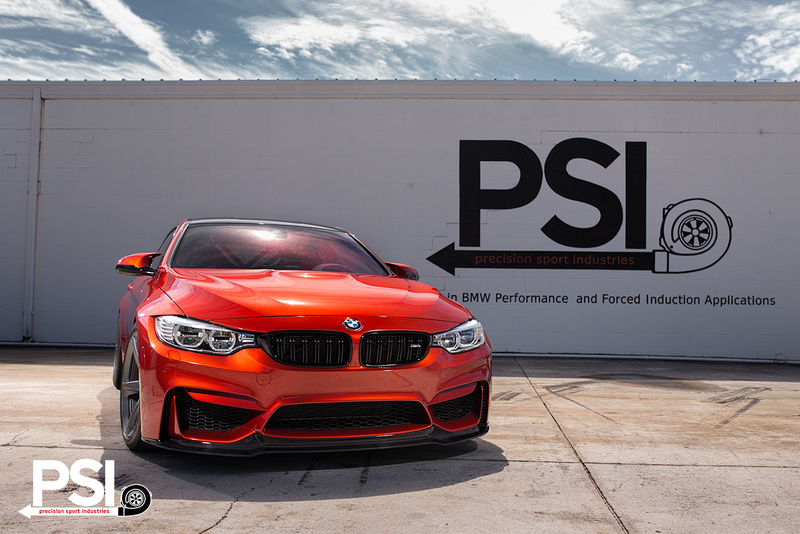 While the SEMA Show was not the full end game we had in mind when our Sakhir Orange M4 arrived months ago, it was certainly the first major stop on a fantastic journey we had mapped out. From the beginning, we all knew the implications involved, and that our vision of an M4 “Club Sport” theme had to be unique yet purposeful. As usual with the aftermarket industry, and with building a project like this one, it boils down to finding that balance. With this foundation to work from, we laid out the plans even before the M4 arrived at our doorstep. Working with several companies, the outline came together in stages. While the initial version with Volk TE37 SL wheels and H&R springs was sufficient at first, the best was most definitely yet to come. 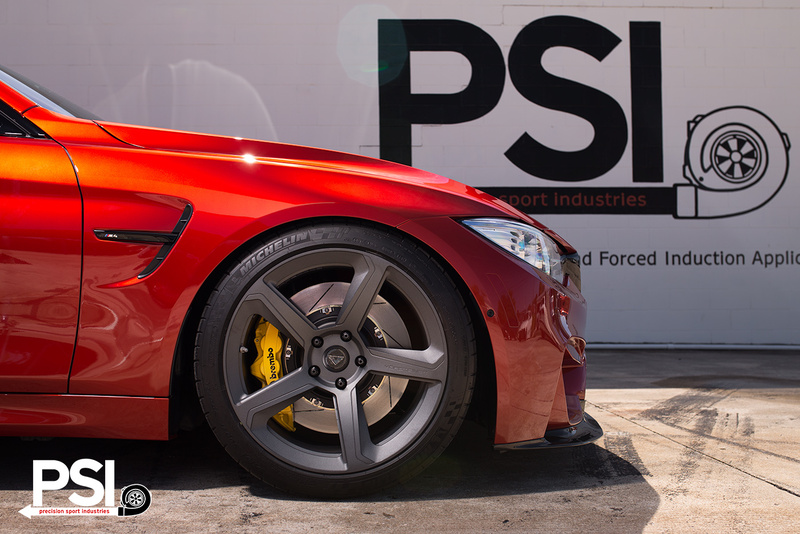 By the time Vorsteiner had released their carbon fiber GTS aero front spoiler and rear diffuser, it was game time. It is hard to describe exactly how much of an impact these Vorsteiner pieces make to the F8x platform, even with the aid of photos. The lines and curves each accentuate the factory angles perfectly, and yet add infinitely more dimensions, challenging your mind to try and keep up. 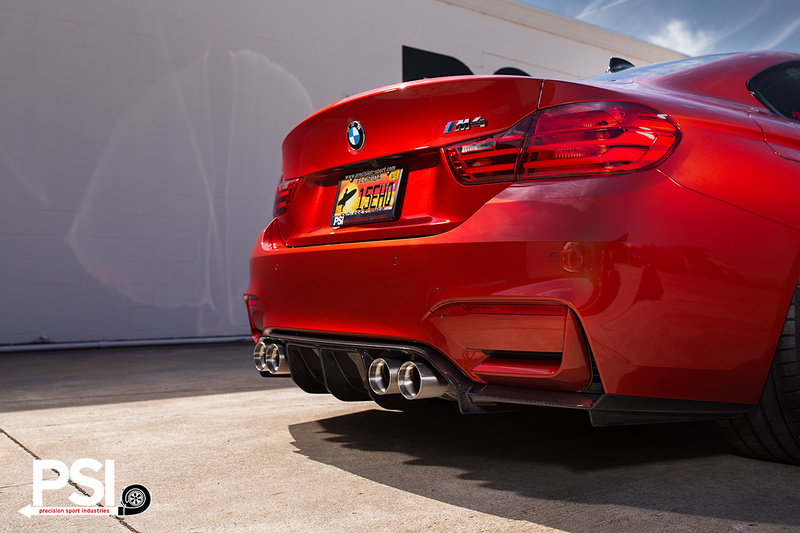 Along with the spoiler and diffuser, a set of gleaming Vorsteiner exhaust tips fill out the diffuser area in ways the OEM exhaust never could. 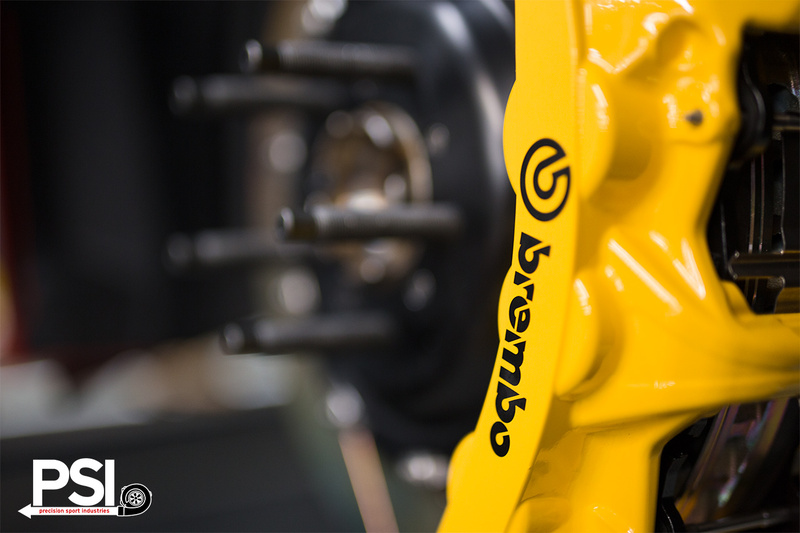 Things ramped up even more when Brembo sent over a giant set of their GT 380mm front and rear big brakes with blinding yellow calipers. While installing these, we added some sturdy extended studs from Motorsport Hardware, upon which we then hung a custom set of wheels courtesy of Vorsteiner. Rather than going with the usual mesh or cross-spoke design, we imagined something a bit bolder, and requested their VSE-005 Special Edition Forged wheels in Textured Gunmetal finish. At the same time, we addressed ride height and stance by reaching out to our friends at BC Racing, who supplied us with their prototype system for testing purposes. So far we can reveal that the ride quality is wonderfully supple, and we are still in the process of dialing in the best spring rate and camber plate setup for various street and track functions. This is the first step in developing the Triple Adjustable setup on the F8x platform, and the finished product will be hitting the market soon. 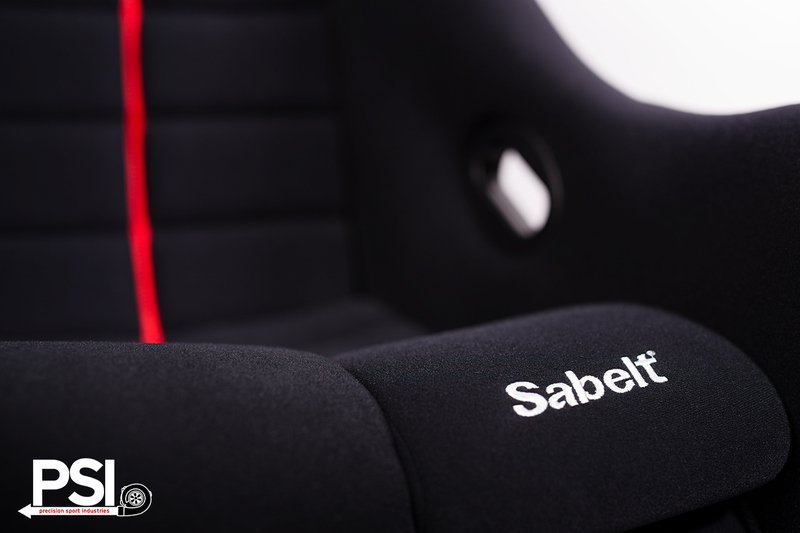 For those of you not familiar, Sabelt is a world class OEM and motorsport seat manufacturer based in Italy, and has been a supplier for F1, GP2, F3, WRC, LeMans Series, and FIA GT Championship teams. 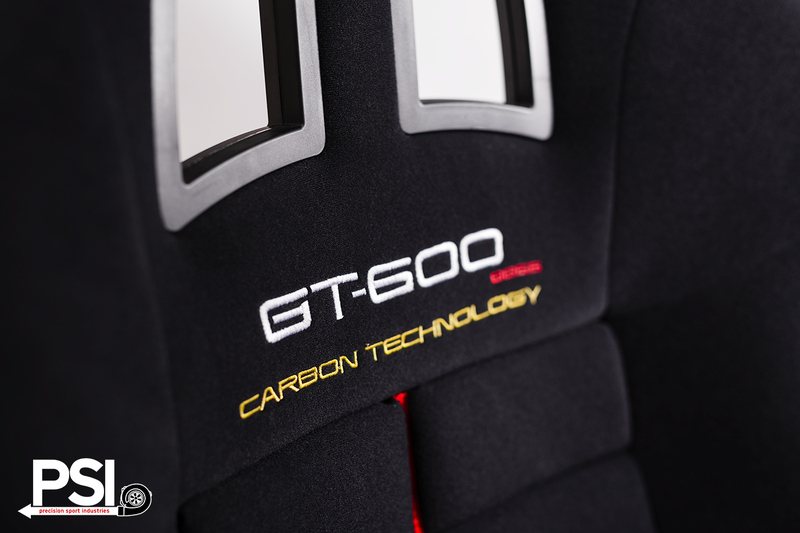 To really give our interior that competition touch, we sourced a breathtaking pair of their GT600 Race Bucket seats with full one-piece carbon fiber shells. 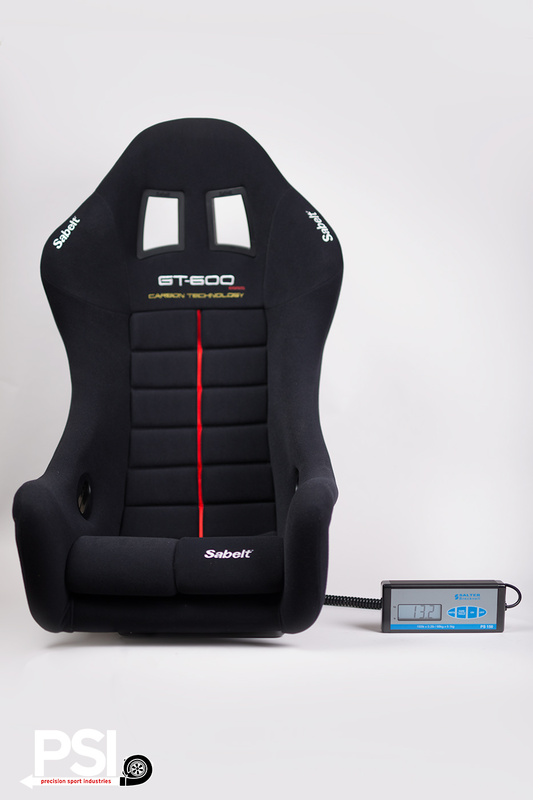 Just the weight savings alone is impressive – each seat weighs well under 14 pounds. What really makes our knees perceptibly weaken are the design and details that go into this setup. 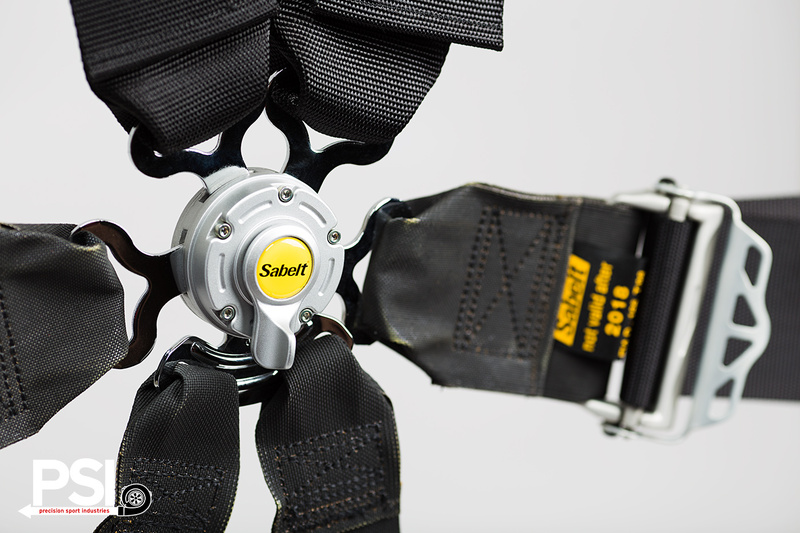 Sabelt developed the Zy-Tex harnesses for use in Formula 1, and it is the lightest webbing material currently certified for use in an FIA homologated harness setup. This new material, dubbed ZY-TEX 49, is exclusively used by Sabelt, and is composed of ultra-high strength fireproof fibers, woven with specific tooling and impregnated with a flame resistant anti-abrasion coating. In simple terms, this is the best competition seating and safety system you can get for your F8x. 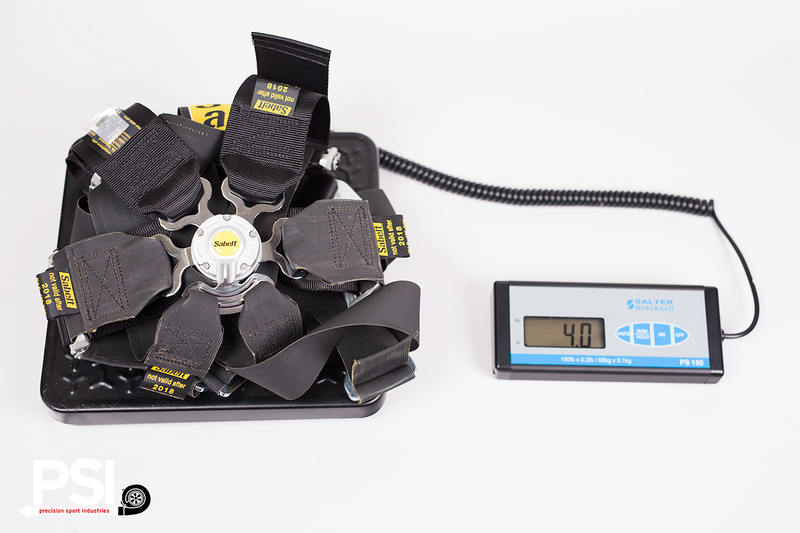 Our Saloon Gold Series belt restraint setup consisted of 3-2″ Hans compatible shoulder belts with 3″ lap and pull down straps. Settle into the deeply bolstered buckets, fasten the 6-point race harness securely with the aluminum quick adjuster, and suddenly you are on the DTM grid, ready for launch. 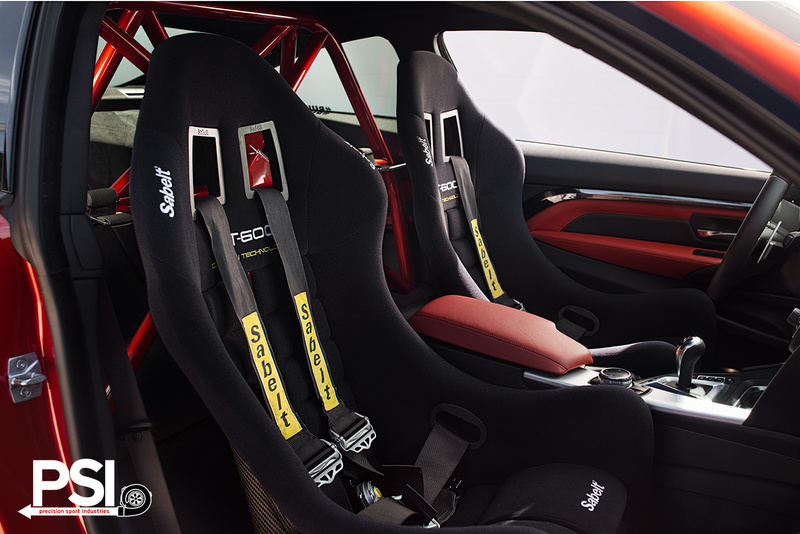 With no real use for rear seats at this point, and plenty of use for additional chassis stiffening, we continued the Club Sport theme with our DTM-style bolt-in half roll cage, painted to match the exterior. With an Alcantara closeout panel finishing the space behind the front seats, there is very little to suggest that you are not in a BMW M4 GTS. In our eyes, that very sensation means our Club Sport mission is accomplished. To give our twin-turbo powerplant some room to breathe, we installed one of the first sets of Gintani stainless steel downpipes. Paired with BMC filters and a JB4 Beta, this is one M4 that has a fair bit of push. The midrange has become even broader, and there is a monstrous, seamless shove from just off idle clear up to redline. 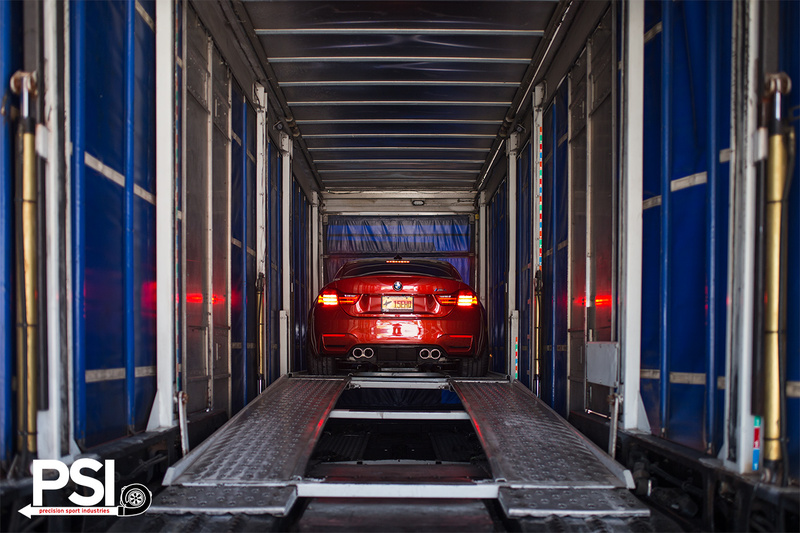 Our team has been building BMWs of all descriptions for many years, and while our passion runs deep for all of them, this one is by far the project that best defines who we are. 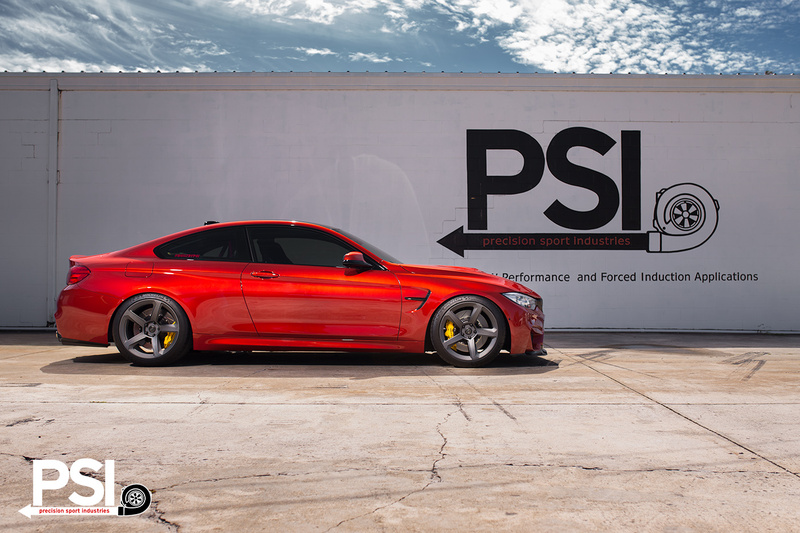 We are very excited for the upcoming SEMA 2014 Show, and as we send off our Club Sport to join the festivities, we envision a bright future with the scorching hot Sakhir Inferno. Look for us at the BC Racing Booth number 21631 during the SEMA Show!